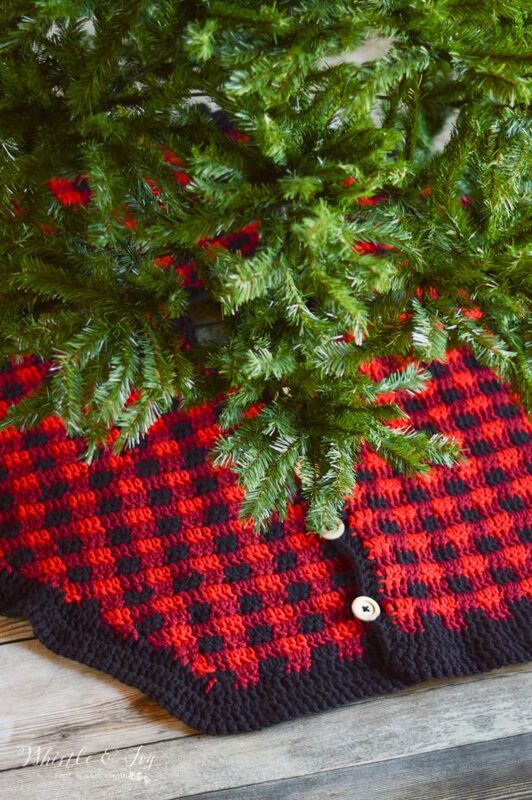 It’s pretty late in the season for more crochet buffalo plaid, but I wanted to squeeze one more in before the official change of the season. 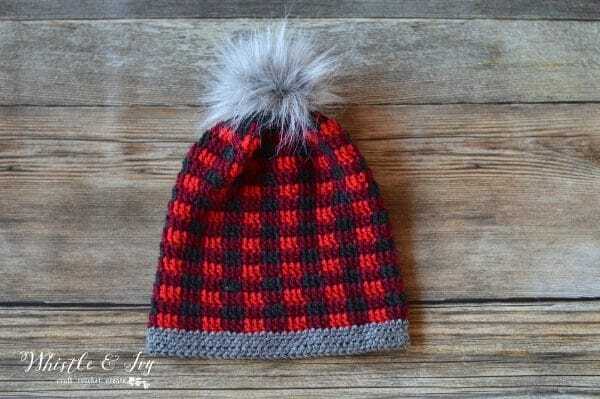 I had several people in the Facebook group ask for a Top Down Crochet Plaid Hat, but I wasn’t sure if I could get it out before spring. I actually prefer bottom-up myself, and feel like top-down is less familiar to me. It took a bit of tweaking, but came together nicely! 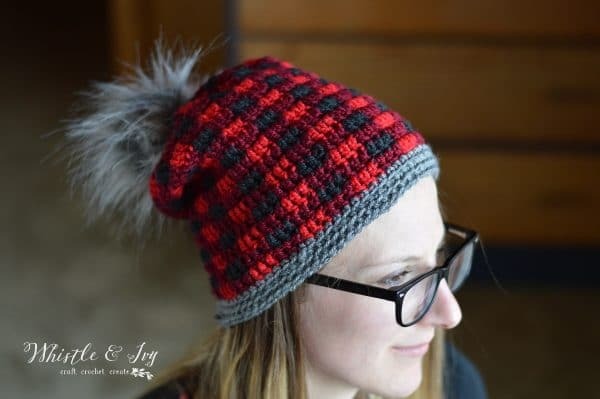 The best part of making this hat top-down is that you can easily make it as slouchy as you want, or you can work less rows and make it a beanie. 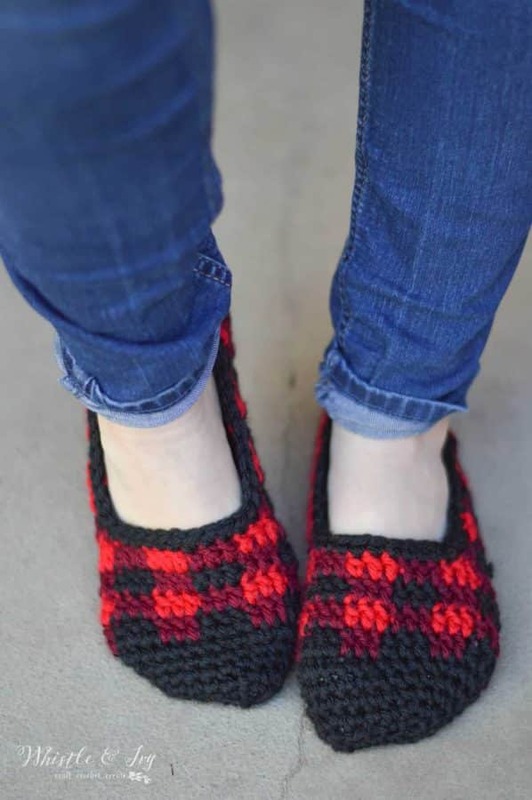 It really is quite easy to make, especially if you are already familiar with crochet plaid. This is my attempt at a St. Patty’s hat. I am not sure I love my color choice! 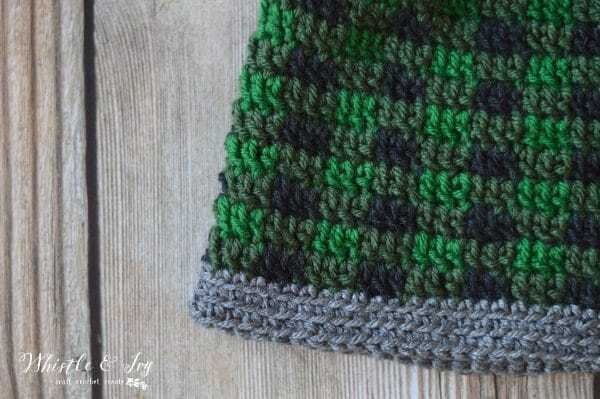 (affiliate–> Make with Knit Picks Brava in Grass, Dublin, Asphalt Heather, Cobblestone Heather). Magic Ring with 1st color. If it’s a bit ruffly that is normal and perfectly okay. 5. – 17. Ch 2. 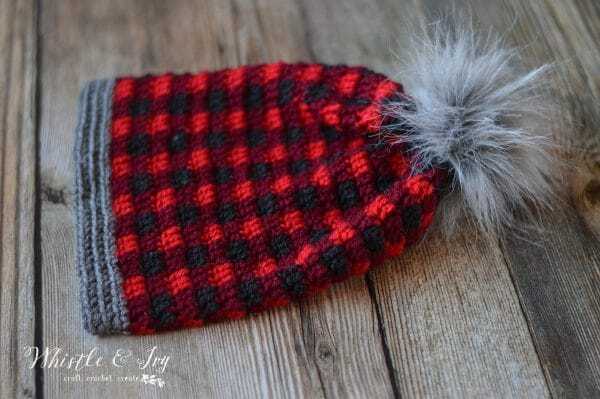 Work plaid stitch all around the hat. Join with sl st. (72 sts) (make less rows here for a beanie-style hat). On last row, Join Color 4 with sl st.
18. Ch 1. Sc in each st around. Join with sl st. Finish by adding a pom-pom. I make my own with fur fabric! 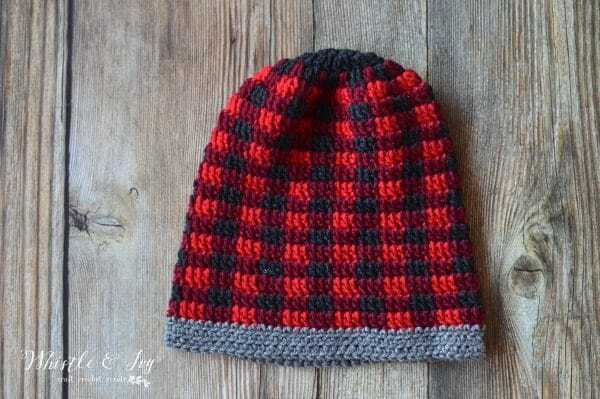 Like this Top Down Crochet Plaid Hat? Subscribe! Hello! You can probably get some on Etsy, but I made this one. It’s quite easy to do! Thanks so much for this top down version of the plaid hat! This is the way I prefer to make a hat! 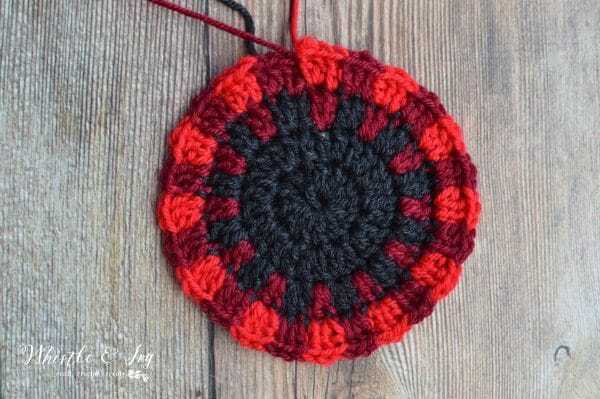 I am thinking that if I wanted to make it a messy bun pony tail hat, that I would just skip to the 24 double crochet stitches and put them on a pony tail holder and continue from there. That’s what I plan on doing any way. Thanks so much! Sounds perfect! I am so glad it worked for you! Thank you for letting me know where to start for the messy bun hat and to use a hair tie. 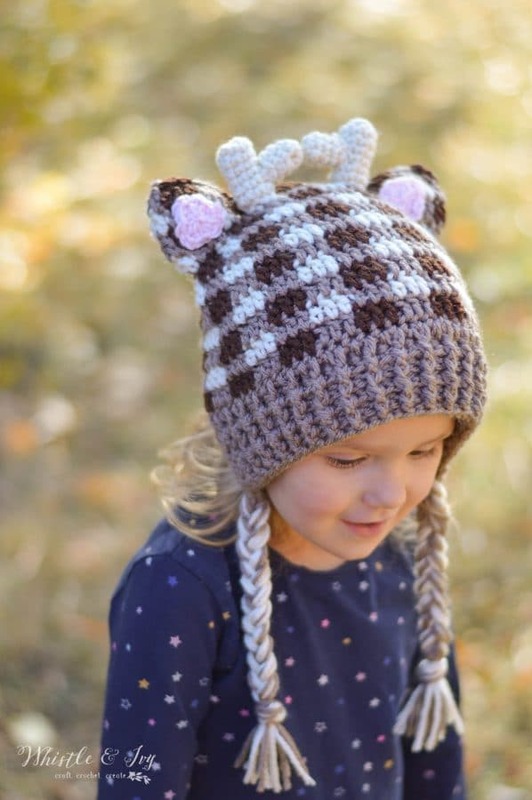 Do you have a child version of this pattern? I love a top to bottom beanie! 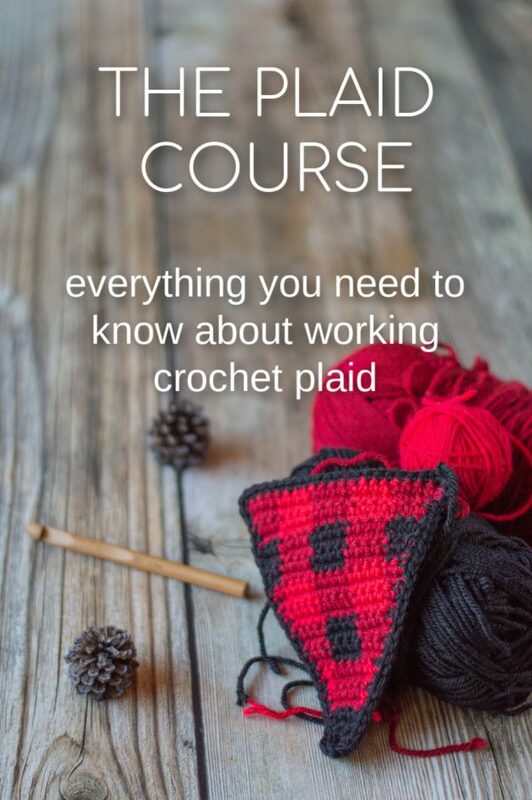 Thanks so much for the plaid stitch tutorial. I just finished a project and can’t believe how easy it was. Not yet! I tried to get it done this year, but ran out of time. It’s definitely on my list for next year. This may seem a silly question but could I use a smaller hook and maybe less rows? You could definitely give it a try! A smaller hook would make the hat smaller, for sure. I used a 4.5mm hook and turned out great for my 5 year old! He has a small head and the hat can also fit my almost-2 year old, lol. Sorry about the repeat post! I accidentally backed out of the page the first time and didn’t think it went through. Thanks for getting back to me! I’ll try it out. Thank You for the top down version, that is how I learned to make beanies. I am a self taught crocheter, so your pictures and videos are very helpful. Written patterns are very confusing to me. 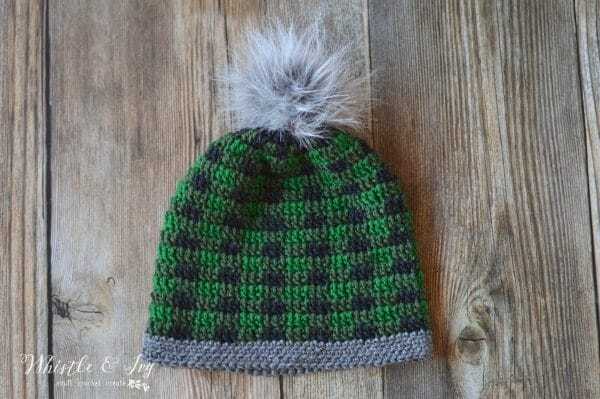 I love the look of the green beanie, what colors did you use? I also love “I Love This Yarn”. Keep up the great work, I appreciate it very much. I love this pattern. Thanks so much for doing the work for a top down version. That is the way I learned to make beanies. I love the look of the green one, what colors did you use? Keep up the great work. I’m new to your channel, very impressed with your straight forward instructions and pictures (videos) are very helpful. I’m a self taught crocheter, so written patterns are confusing to me. Thanks again for this pattern. If I can master this pattern you will differently get credit. I have another question. 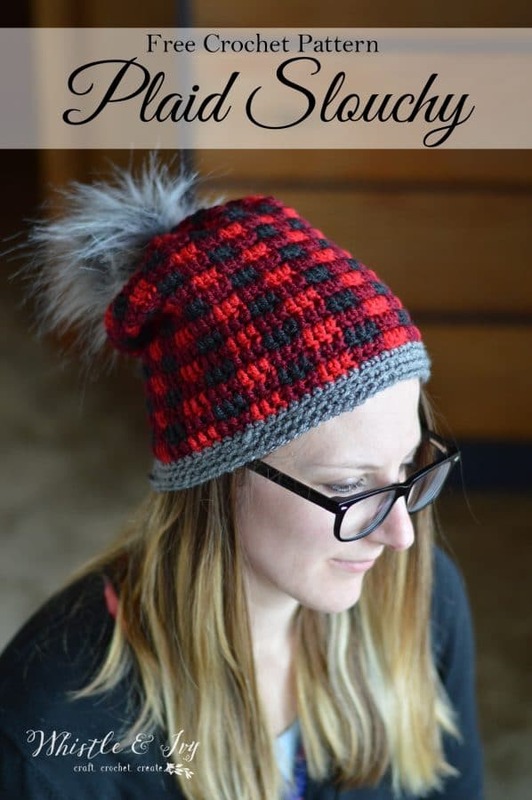 I want to do the hat again but this time with worsted weight yarn and was wondering if you think 180 yards of each color is enough? Hi Bethany, I am absolutely loving making this hat so far! I just had a question.. I’m using bulky 5 weighted yarn so it’s definitely turning out bigger than needed with the 72 stitches. Do you happen to know how I would size this down? How many stitches I should do instead of 72? (I’m pretty new to crochet so any help would be amazing). Thank you! You will need to size it down in multiples of 6, so go down to 66 sts. You are very welcome! I hope it works for you! Thank you so much Bethany !! 😘😘😘😘😘😘. Thank you, Bethany. As much as I love all your patterns, I am glad for the top down version. I don’t know why, but I have more trouble with any bottom up pattern. I’m excited to give this one a try. Thanks again! I appreciate that you share your amazing patterns with us. You are very welcome! I knew there was a need, I hope you enjoy making it!